Low miles 2015 Chevrolet Silverado 1500 LT Crew Cab 4x4 with Remote Start, fog Lamps, Keyless Entry, Backup Camera, Fog Lamps, and Chrome Package! Stepping up to the LT adds a chrome grille insert, an "E-Z" lift/lower tailgate, alloy wheels, cloth upholstery (with adjustable lumbar support for the driver), carpeting, a leather-wrapped steering wheel with audio controls, and six speakers for the audio system. The 5.3-liter V8, which is standard on the LTZ trims and optional on other Silverados, makes 355 hp and 383 lb-ft of torque. Overall ride and handling dynamics are some of the best available in any full-size truck. The 2015 Chevy Silverado 1500 feels robust structurally, yet most versions are compliant and comfortable over broken pavement. This vehicle passed our 110 multi-point inspection and is backed by our National Quality Dealer of the Year Award. We are an ''A+'' Better Business Bureau Rated Business. We offer low interest rate financing, low down payments and the highest trade allowances in the state! Here at McCloskey we do things a bit differently, we shop our competition every day to ensure a great value to you. Come on down and experience it for yourself. 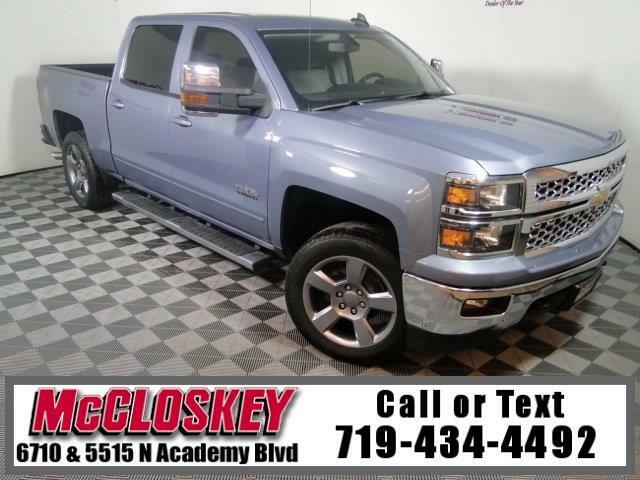 This McCloskey Assured vehicle includes a 2 month/2000 mile Warranty and a Vehicle History Report!! At McCloskey we strive to provide ASSURANCE, TRUST, VALUE AND QUALITY! Call 719-434-4492.